Some time after 988 A.D., when Grand Prince Vladimir I married a Byzantine princess and consequently became a Christian, the painting of Our Lady of Kazan was treasured and revered by the Russian people. The icon’s origins are rooted in the early founding days of the church of the apostles. It was brought from Constantinople, across the Black Sea, up the Volga River to a monastery in Kazan, deep in the interior of the former Mongolian Empire. By 1101, pilgrims were traveling vast distances on foot to pray before this icon. In 1209, the city of Kazan was overrun and conquered. Angry mobs destroyed the city and the monastery – the icon being lost in the rubble, apparently lost forever. Three hundred and seventy years later, on July 8, 1579, a small, nine-year old girl named Matrona was suddenly startled by an immense flash of light. She fell to her knees in amazement at the beauty, holiness, and eternal kindness of the Mother of God – who was standing on a cloud and clothed in the brilliance of God’s love. 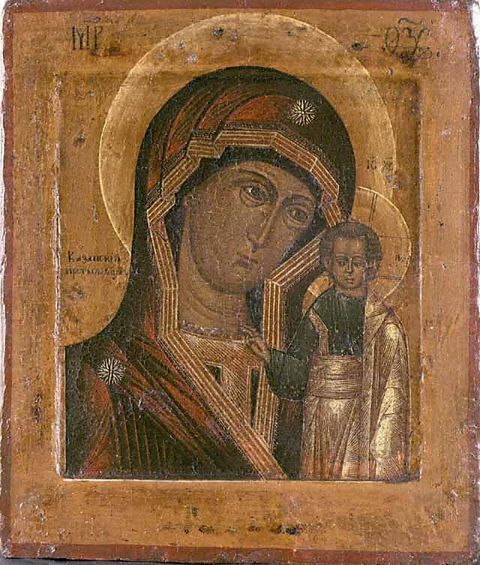 The “beautiful lady” asked the child to rescue the ancient and holy icon of Our Lady of Kazan from the burned-out ruins of the old monastery near Matrona’s home. She was to give certain directions and specific instructions to the people so that they could locate it. Word spread quickly, and many people gathered at the ruins. Matrona quietly repeated the instructions that she had heard from Mary. The others sang folk songs with joy and great anticipation. In no time at all, digging right where Mary said to look, they uncovered the miraculous icon. Suddenly, there was total silence. People had fallen to their knees in astonishment and awe as they experienced the sacred Presence in the icon. People spoke of a divine light that radiated forth from the painting of Our Lady of Kazan. Thousands upon thousands gathered at the site of the apparition. Even high-ranking clergy and aristocrats wept with amazement. Almost immediately, miracles and healings occurred in the lives of those who gazed with reverence upon the holy icon. Somehow, the sacred icon had been saved and mysteriously removed from Russia — and discovered years later in a castle in England! 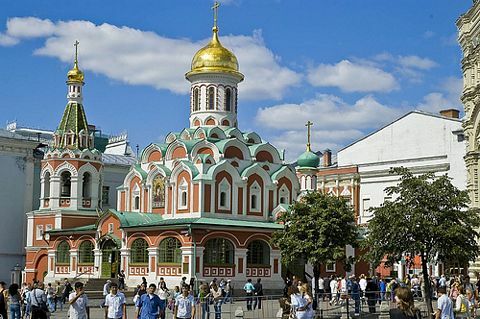 Seventy-five years after its destruction, the great basilica was reconstructed at Red Square. The sacred icon has been housed at Fatima in a beautiful Byzantine-style Shrine, constructed especially for its time in exile. On October 13, 1992, His Holiness Aleksey II announced that Russia looks forward to the “peace and abundance” that its anticipated return shall bring eventually.